OK, so I did it. I ordered those 25 free prints from Artifact Uprising. And just like AU’s website says, I got some great photos off my device and into my life. Sort of. The pics sat around for a whole month in their protected, well-packed cardboard box. But after I got the photos, I started exploring how to display them. I considered framing each one and hanging them in a grid. But a grid’s worth of matching frames would cost several hundred dollars. Not happening. Then I thought I would like to hang little shelves with the pics lazily leaning against the wall. Major project. Weekend of hardware store, drilling, installing. No time for that this year. So I started playing around with my Cricut and some black paper. I cut a black paper mat, 7.5 inches square, with a 4.5 inch square hole in the middle. That makes a 1.5″ border all around. Then I used blue painter’s tape to secure each picture to its mat. After that, I cut a 7.5″ square for backing, using a tape runner (think scrapbook store!) to secure the backing to the mat. I rolled 4 pieces of the blue tape and put one piece in each corner. Then I hung them. Voila! I created an eye-catching photo display that makes a pretty bold visual statement. For a 4 x 4 display–16 photos, you’ll need 32 pieces (or more, if you’re mistake-prone like me! )of 8.5 x 11.5 cardstock, a roll of blue painter’s tape, a scrapbook-style tape runner, a level, a large blank wall. Dramatic and plush, the Iceleaves shawl is a fast knit using superbulky yarn and size 19 needles. With a gauge of almost 2 stitches per inch, you’ll be done knitting this before you’ve binge-watched two episodes of your favorite series! This pattern is for your personal use only. Please don’t sell items knit from this pattern, and please don’t pass the pdf along to your fellow-knitters. Instead, refer them to this blog. 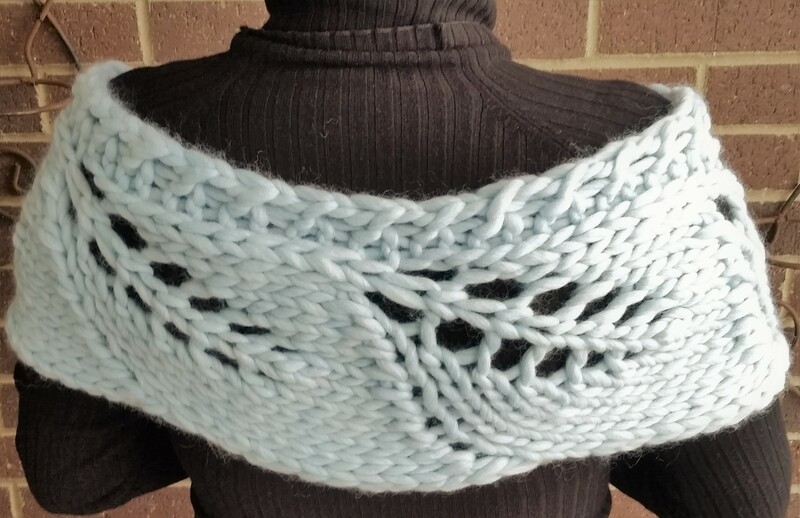 Click ice-leaves-shawl to download.